Some months ago I attended St. John the Baptist Church for the funeral of a young villager, and was pleasantly surprised when a man approached me and asked if I was Mr Bond, and did I recognise him. My responses were 'yes' and 'no'. He then explained that he was Mr Hampshire, a name I readily recalled as a former Headmaster of our village school. He was apparently living in Wokingham. In truth I regretted not having recognised him, but could not remember having had much contact with him during his Eton Wick tenure. Even so I was much impressed that after thirty years he came back to attend the funeral of this forty one years old man, who I presumed had been a pupil of his so long ago. At this point I can well imagine Eton Wick's late author and historian, Dr Judith Hunter's oft quoted advice "Frank, in history we must never presume!' - Sorry Judith -. This incident had me thinking about my own school years of 1927 - 36 which started in the village school until I was seven years old; and then on leaving the infants came the long tramps to Eton Porny School until I was fourteen. This was normal for all the Eton Wick boys, but girls had the option of doing all their schooling in Eton Wick. There were of course no school buses, no school canteen or school meals, which effectively necessitated returning to our village homes for the midday meal, and then a return to Eton and school. Classes were known as 'standards' and we had the same teacher for most subjects for the year. The exception was for woodwork, gardening, swimming and occasional sport. Gardening and singing were the subjects that Mr Frampton, the Porny Headmaster, took charge of. The school had its own site of allotments; situated on the 'Slads' and just outside the Eton recreation ground west boundary. Even on really hot days the 'head' would not allow drinking at the water pump because in his opinion men never worked as well when they had taken a drink; after 3pm it was acceptable. Rudyard Kipling's famous `IF' poem could well have added a two line sequel - "If you can't sing, or strive away in your allotment you are never going to be a man my Son". Other Eton Porny teachers of the early 1930's included Mr Hoare, a firm disciplinarian, which in those days meant use of a cane, either by necessity or perhaps mood. He often had the lads chanting - "Old Colin Hoare is a very good man, he tries to teach us all he can, Reading, Writing and Arithmetic, and never forgets to give us the stick". In todays' world talk of corporal punishment is an abhorrence, but it also did much to deter the big boy bully. Perhaps a price that some tormented youngsters of today would consider worth paying. Every age has its beliefs until technology makes them outdated. Mr Hoare told us that skyscraper buildings would never be a feature in England, because unlike New York we lacked the rocky ground on which to support them. I am sure there are Londoners who would now wish that was so. Also, that men were hoping to land on the moon, but of course that would never be, due to lack of air. Again, man wanted to split the atom, but fortunately he could not, because if he did there would be such a chain reaction that the world would not survive. In little more than ten years Nagasaki and Hiroshima knew otherwise. Probably Mr Hoare was well regarded by pupils on account of his having served and been wounded in the Great War of 1914 -18. Colin had a silver plate inside his forehead where he had suffered a shrapnel injury. I conclude - must not presume again - that he had volunteered to join the army in the early months of the war. With little more than perhaps heads above the trench parapets there were many such head wounds; until in late 1915 when the steel helmet came into general use. All those serving before this date were volunteers, as conscription was first introduced in the spring of 1916. As a teacher he had several unusual methods. This was a time of much unemployment and like many others he advocated the slogan of 'Buy British'. He would say "My shoes are British made of British leather" -. "my pocket knife was Sheffield made", and so he went on. Occasionally he would say "That will do for lessons today boys, you may now ask any question you choose". This was always popular, although on one such session a lad said "Sir, when I go on the common I sometimes see a cow jump on the back of another, why is that?" The quick reply "I do not want that sort of question." Other teachers in the early years of 1930 included a young Welshman; Mr Hughes, whose favourite subject was natural history. Beyond any doubt, an enthusiastic teacher quickly imparts his knowledge to willing pupils and we were soon observing the plants and birds around us. Regrettably he only stayed at Eton a few years before moving on to South Africa. A very unusual move, and certainly at that time when working class just did not travel either for work or holiday. Another young teacher was Mr Birmingham. I think this could have been his first school as he certainly had much difficulty in controlling the boys. I do hope in time he acquired whatever it takes to apply discipline. He was kindness itself, even buying prizes for particular achievement. Most boys wore short trousers until they left school at fourteen years of age. There was no school uniform, although the 'Porny' football team played in chocolate brown and blue, the school colours. Eton always had a good football side, and Mr Frampton was known to say 'all the best footballers came from Eton Wick' - the long walks every day to and from school gave the village lads better leg muscles. He certainly had no cause to include me. These were turbulent years, as Europe was bubbling over yet again, despite there being only seventeen years since the Great War had ended. Mussolini had sent an Italian invading force into Abyssinia - now Ethiopia - and were reported to have used gas against the natives. Maybe they did, but news reporters have been known to exaggerate or distort facts. In Spain General Franco had opposed the establishment and the country was struck by civil war. To some extent this resulted in Spanish pupils evacuating to Britain, although I never knew of any living locally. On one occasion Mr Frampton, the 'Porny' head, announced that a football match had been arranged between the Eton School and a Spanish boys team. He expressed sadness at their plight and asked for every consideration toward the Spanish visitors. I think he stopped short of asking 'Porny' to throw the match but I got the impression he would be pleased to think the opposition won. I had left school four years before changes really had an impact. After the third year the country was at war and then came the change in school status, with newly opened Ragstone Road School drawing all the pupils over eleven years of age. Both Eton Wick and Eton were Church of England schools and of course still are; but I do wonder if present day respects of other creeds results in less imposed influence of our traditional faiths. Apart from a small Dame School in the early nineteenth century there was no school in Eton Wick until 1840 when thanks largely to the enthusiasm of a young Eton College tutor, Henry J Chitty Harper, who was also a Conduct (Priest) and of the Eton Provost (also Vicar of Eton Parish) a site was found, and money raised by donations and subscription for the villagers' first school. It was not large, having just one classroom 29 x 21 feet; brick built and situated at what we today know as the junction of the 'Walk' with the main road. In 1840 there was no 'Walk' road; at best just a track leading to the Greyhound public house, approximately 130 metres north. The pub had only been licenced about seven years earlier, and the village population was less than four hundred. The site was leased from William Goddard of Bell Farm for the generous sum of ten shillings a year rent; roughly equal to a labourer's weekly wage at that time. The building cost £259. Education was not compulsory, but pupils were expected to pay a penny or two where possible. It may not seem much to pay, but with a family of several at school it would have been difficult. Although unwittingly at the time, William Goddard was responsible for the later development of Boveney New Town. In 1870 he sold Bell Farm to Eton Council for their town sewage. As we have seen previously, within a few years the Council sold nine acres of their acquisition as being surplus to their needs, and in only a short while Alma, Inkerman and Northfield Roads were created and duly lined with late nineteenth century homes, effectively doubling the population, which soon made the first school of 1840 inadequate, and in 1888 a second larger school was built in Sheepcote, adjacent to the church which was built twenty two years earlier. Rev. Harper later became the Bishop of Christchurch in New Zealand, superseding Bishop George Selwyn, who had in fact been the Bishop of all New Zealand. Previously both men had been Conducts at Eton together, and both had worked beyond their College remit. Selwyn preached from Boveney Church and in Windsor before going 'down under'. He also rowed for Cambridge in the first varsity boat race of 1829 before going to Eton as a tutor. Both men were larger than life. 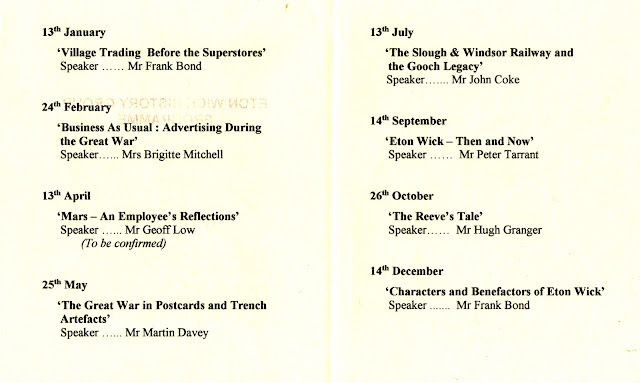 The article is by Frank Bond and was first published in the Eton Wick Newsletter, Our Village. The Newsletter is produced and distributed by the Eton Wick Village Hall Committee. Mr. EDWARD COMPTON AUSTEN LEIGH, Foreman. Mr. HENRY BUNCE, Mr. EDWARD LITTLETON VAUGHAN, Mr. ALEXANDER CHARLES TUTT, Mr. SIDNEY EVANS, Mr. FREDERICK JOHN LOVELL, Mr. GEORGE GOSLING, Mr. ROWLAND BOND, Mr. CECIL HOWLETT, Mr. WILLIAM ELKINS, Mr. HENRY CALTHROP HOLLWAY CALTHROP, Mr. HENRY POWELL. The Jurors present that Mr. JAMES TARRANT be continued Bailiff of the said Manor. They present that Mr. WILLIAM MIDDLETON be Hayward of this Manor. The Jurors present that the railings round the Cricket pitch on the Great Common be allowed to remain as well at the will of the Lord of the Manor as of the Freeholders and Tenants of the Common. The PRESENTMENTS and ORDERS for the GREAT and LITTLE COMMONS, for the stint and rate of Cattle to be kept and depastured there from the First day of May, until the First day of August, and for the rate and stint of Beasts and Sheep on the Lammas Grounds, Common Fields and Commons to be kept and depastured from the First day of August to the Thirty-first day of October, and for the regulation and good management of the Commons, Lammas Grounds and Common Fields of the said Manor throughout the year made at a view of Frank-pledge with the General Court Baron, held in and for the said Manor, on Monday the Sixth clay of March, 1871, then in force were confirmed. END OF COURT. I. The Jurors present and order—That no Cattle shall be turned upon the Great or Little Commons, until :after Six o'clock in the Evening of the First day of May in every year. II. They present and order—That no Freeholder, Farmer, or Tenant, hath or shall have a right to keep or feed on the said Common, but after the rate of one Beast for every five acres of land ; but if any Freeholder, Farmer, or Tenant, shall have three odd acres, then one Beast for the three odd acres which is to extend to a person having three acres only ; and likewise after the rate of one Sheep for every acre he holds : and that no Townsman, Cottager, or Resident Farmer, for or in respect of his house, hath or shall have faring or Common for more than one Beast, upon pain for every offence, after notice given of Ten Shillings to the Lord of this Manor ; and Sixpence per head to the Hayward for all above that number when Pounded : and that no person shall have a right to turn out on the said Commons any Cattle, unless such Cattle shall be his or her own property, and actually kept and used by him or her under the like penalties. 6 III. 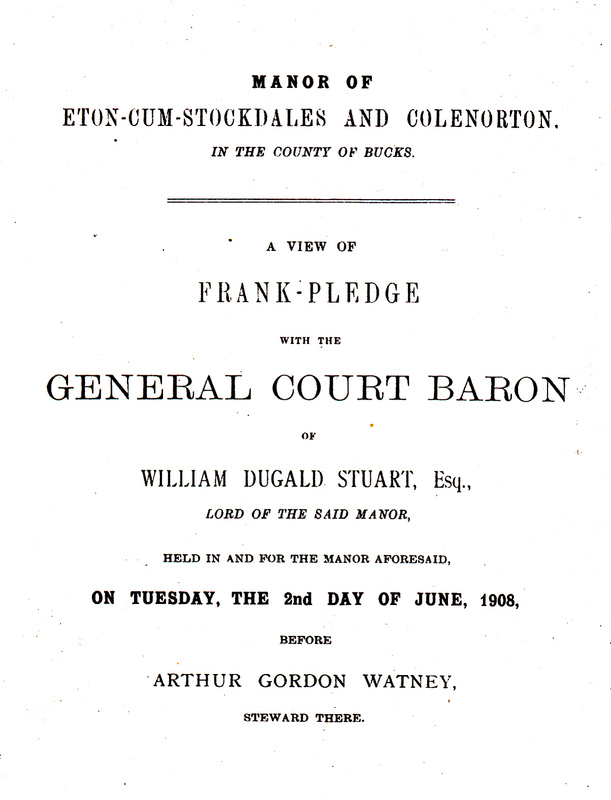 They present and order--That no Freeholder, Farmer, or Tenant, Townsman, or Cottager, bath or shall have a right to let any faring on the said Commons, from the opening of the Commons until the 1st of August, under the penalty, for every offence, of Ten Shillings to the Lord of this Manor, and One Shilling per head to the Hayward when Pounded. Ty. They present and order—That no Townsman, Cottager, or Resident Farmer paying rates for more than one house shall have a right to turn more than one head of Cattle on the said Commons, until after the First of August. I. The Jurors present and order—That every Freeholder and Tenant shall have a right, for every acre of his land, to keep one Sheep, and for every five acres, one Beast; and if any one of the said Freeholders or Tenants, shall have three odd acres, then one Beast for the said three odd acres; which is to extend to a person having three acres only. II. They present and order—That if the Freeholders or Tenants aforesaid do keep any Cattle, Sheep, Horse, Oxen, or Kine, after notice thereof given by any Freeholder, Farmer, or Tenant of the Manor, or by the Bailiff or Hayward of the said Manor, contrary to the stint and rate herein expressed, then they and every of them shall forfeit every time they shall so offend, after warning given, Twenty Shillings to the Lord of this Manor, and One Shilling per head to the Hayward when Pounded. III. It is presented and ordered by the same Court—That no Householder or Cottager within the said Town or Manor, hath a right to keep, or shall keep, above two Beasts, whereof one of them may be hired, upon the Commons, Lammas Ground, or Common Field, after the First day of August, upon pain for every Cow, or other Beast so to be kept contrary to the said order, of Ten Shillings to the Lord of this Manor, and One Shilling to the Hayward when Pounded, after warning once given. IV. It is presented and ordered—That no Tenant or Inhabitant within the said Manor, that hath any ground, shall let his, her, or their Common Right in the Commons, Lammas Grounds, or Common Fields, unless it be to his neighbour dwelling in the said Parish, upon pain of Forty Shillings to the Lord of this Manor, for every time so offending. V. It is presented and ordered—That no Farmer or other person shall let his or their Common for Sheep to any persons but those that have right of Common for Sheep by their land, upon pain of forfeiting to the Lord of this Manor, for every Sheep so taken, One Shilling, and to the Hayward for his pains, Fourpence for every such Sheep. VI. It is presented and ordered—That no Householder or Cottager shall common in the said Fields until the First of August, but upon leave from the Owners thereof ; under the penalty of Forty Shillings to the Lord of this Manor, and One Shilling per head for Cattle, and Twopence per head for Sheep, to the Hayward, when Pounded. VII. It is presented and ordered—That no Inhabitant or Dweller within the said Manor, shall graze, feed, or keep their Cattle upon any of the lanes or paths, within any of the' Fields Within the Manor aforesaid, upon pain for every time they shall be so taken, after notice given, of Five Shillings to the Lord of this Manor, and One Shilling per head for Horses and Cows, or other Cattle, and Twopence per head for Sheep to the Hayward, when Pounded. VIII. It is presented and ordered—That every Farmer and other person, shall take their Sheep out of the Common Fields on the First of November, under the penalty of One Shilling per head to the Lord of this Manor, and Fourpence per head to the Hayward, when Pounded. IX. It is ordered—That no person do turn any Sheep (except 12 Cribbers for the Manor Farm) on the Great Common, till Twelfth of December St. Andrew's Tide, Old Style, under the penalty of One Shilling per head to the Lord of this Manor, and Fourpence to the Hayward, when Pounded. X. It is ordered—That no Farmer or other keep any Sheep upon the Common Meads, except the Hide and Water Slade, from the First of August until Michaelmas Day, Twenty-ninth of September, upon forfeiture, for every Sheep kept to the contrary, of One Shilling to the Lord of this Manor, and Fourpence to the Hayward ; and also to take out their other Cattle from the said Fields by All Saints, First of November, upon pain of forfeiting, for every Beast, of One Shilling to the Lord of this Manor, and Fourpence to the Hayward ; and also to take out their other Cattle from the said Fields by All Saints, First of November, upon pain of forfeiting, for every Beast, One Shilling to the Lord of this Manor, and Fourpence to the Hayward, when Pounded. XI It is presented and ordered—That no Owner, Townsman, or Cottager in this Manor, shall have a right to Hogs or Pigs into the Commons, Common Grounds, within this Manor (except he, she, or turn more than Two Fields, or Lammas they, shall not turn on a Beast, and then to be allowed to turn on Four Hogs or Pigs) ; and that every Owner or Renter of five acres of land shall not have a right to turn in more than One Hog or Pig, and so after that rate ; and that all such Hogs or Pigs shall be rung before they are turned out, on pain of forfeiting Two Shillings per head to the Lord of this Manor, and Sixpence per head to the Hayward, for every Hog or Pig so turned out, above the rate aforesaid ; and for every Hog or Pig so turned out without being rung, as often as they shall be Pounded. XII. It is presented and ordered also—That no Hogs or Pigs be turned into the Corn Fields until all the Harvest shall be got in, under the penalty of Two Shillings per head to the Lord of this Manor; and that no person shall suffer their Hogs or Pigs to run in the streets or lanes of this Manor without a keeper, upon pain of forfeiting One Shilling to the Hayward, when every such Hog or Pig shall be Pounded by him. XIII. It is presented and ordered—That every Tenant, for his part and proportion against his land, shall well and sufficiently make and scour the Ditches about the said Commons, in every place where need requires, within the said Manor or Lordship, before the feast of St. Andrew the Apostle, Thirtieth of November ; upon pain of forfeiting to the Lord of this said Manor, for every Pole not sufficiently done, Four Shillings ; and thenceforth to keep and maintain the said Commons with sufficient Hedges and Ditches from time to time, as often as shall be needful, upon the like pain for every time so offending as aforesaid ; and yearly after to be made sufficiently secure by All Saint's Day, First of November, upon the like pain of Four Shillings for every Pole so neglected. XIV. It is presented and ordered—That all out-fences of the parish be kept by those that are Occupiers of those Lands, as well after Lammas as before for the preservation of the Corn ; upon pain of forfeiture for every time, after notice given, of Five Shillings to the Lord of the Manor. Shillings to the Hayward when Pounded. XVI. It is ordered—That the Farmers be allowed to sow Five acres of Turnips for every Twenty Acres they hold, they keeping sufficient Fence. XVII. It is ordered—That all in-ground be excluded, in Lammas or Common Land, from a right of Common, and that no person holding them shall have right of Common or Lammas for the same. PRESENTMENTS and ORDERS for the Regulation and good Management of the COMMONS, LAMMAS GROUNDS, and COMMON FIELDS of the said Manor, throughout the Year. I. The Jurors present and order—That any person, who does not pay Parish Duties, in the Parish of ETON and Manor aforesaid, and who is not clear on the books, hath, or shall have any right to Common on the Commons, Lammas Grounds, or Common Fields, in the said Manor. II. They present and order—That no person having right of Common on the said Common, Lammas Grounds, or Common Fields, of the said Manor, hath, or shall have a right to rent more than One head of Cattle or Faring from his neighbour (except Sheep), under the penalty for every time so offending of Twenty Shillings to the Lord of this Manor. III. They present and order—That all Farmers as well as Inhabitants of the said Manor, shall make the Hayward the keeper of their Cattle, and shall pay Sixpence for every Beast at the time of putting such Beast into the Commons, Lammas Grounds, or Common Fields, and Fourpence per head per week afterwards, as long as they shall be kept in the Commons, Lammas Grounds, or Common Fields, of this Manor : and that the Cattle be marked with the initial of the Owner before put in. ur The Hayward is desired not to remove the Cattle from the Lammas Grounds into the Commons, until the dusk of the Evening. IV. It is ordered—That no Geese be kept at any time hereafter upon the Commons, Lammas Grounds, and Common Fields, aforesaid, upon pain for every Goose or Gander there kept to the contrary, after notice thereof once given, of Five Shillings to the Lord of this Manor, and Fourpence to the Hayward, when Pounded. V. It is ordered—That no person be allowed to drive Sheep through the Commons, from the gate at the Lower end of the Common to the Upper end, and from the Upper end to the Lower end; and that they take no more time than necessary in driving them across at the Upper and Lower end of the Common, under the Penalty of Forty Shillings to the Lord of this Manor, and Five Shillings to the Hayward, for every offence. VI. It is ordered—That no person shall drive his Waggon, Cart, or any other vehicle from the Upper end of the Common to the Lower end, nor from the Lower end of the Common to the Upper end, upon forfeiture, for every time so Offending of Ten Shillings to the Lord of this Manor, and One Shilling to the Hayward. VII. That no person shall be at liberty .to change their Cattle turned into the Commons, Lammas Grounds, or Common Fields, of this Manor, above once in every 48 hours, under the penalty of Twenty Shillings per head to the Lord of this Manor, and One Shilling per head to the Hayward. VIII. That no person shall be at liberty to turn into the Commons, Lammas Grounds, or Common Fields of this Manor, any Stone-Horse, Rigg, Bull, or Ox, under the penalty of Twenty Shillings per head to the Lord of this Manor, and One Shilling per head to the Hayward when Pounded; nor any Distempered Cattle, under the penalty of Five Pounds per head to the Lord of this Manor, and Five Shillings per head to the Hayward. IX. That no person shall suffer their Sheep to feed on the young clover, under the penalty of Sixpence per head to the Lord of this Manor, and Twopence per head to the Hayward, when Pounded. XI. It is ordered—That the Bailiff shall have the power to suspend the Hayward in his office, for neglect of duty, or for any improper conduct connected therewith. But the Bailiff shall, within six days after the charge or charges are laid, convene the Jury, who shall be eligible to appoint a new Hayward, if they consider such course necessary. XII. It is further agreed and ordered—That the Steward of this Court may alter matters of form in these Presentments and Orders, not altering matters of substance. The Frank-Pledge has a history dating back to King Canute in the 11th century. Read more about its history here. General Court Baron has a history going back to feudal times. Read more about its history here. Tony Anderson: Village recollections from the 1950's and 60's. Roy Arnold was correct in saying that my Brother Jerry and I lived with our parents Arthur and Connie Anderson at number 13 Eton Wick Rd. They ran the Newsagents, Tobacconist and Confectioners; there was a barbers shop to the rear. Sadly my father passed away at his home in Princes Risborough in October 1992 and my mother a few years later. 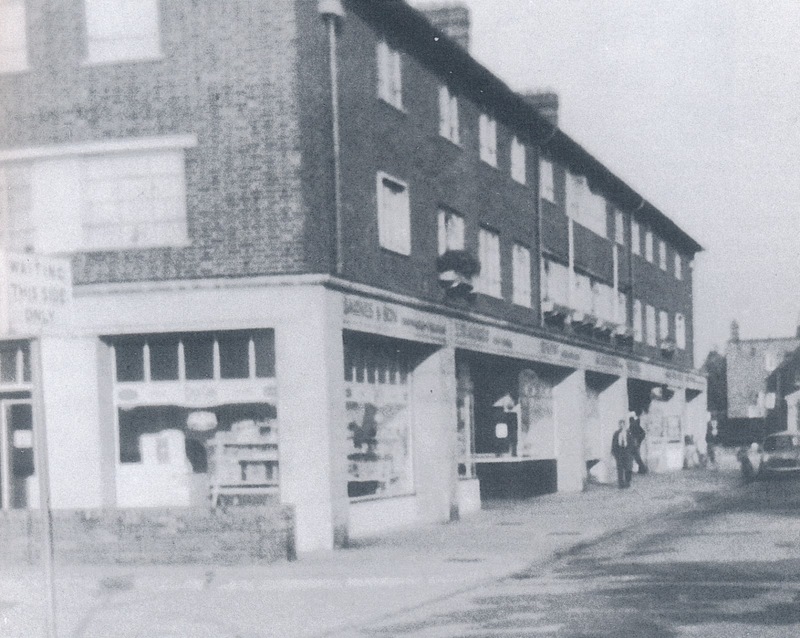 The other shops on the Parade were Mr Clark's Fish and Chips, Mr Arnold the Butcher, O'Flaherty the Chemist, Clinch the Baker from Eton, the Ormond family who ran Darvilles, the grocer from Windsor and Frank Bond the green grocer. Younger readers who are still interested and not turned off by my ramblings will be concerned by the lack of Banks, Estate Agents, Charity Shops, Coffee Shops, Ladies Hairdressers, and Betting Shops, how did we manage without them. Other businesses of note were of course J T Ireland the builder who was a local councillor and county councillor who completed the construction of Tilstone Close whilst I lived in the village. Bob Bond a haulier and Constructor, Ron Clibbon who was an accountant lived in Tilstone Close and traded from a shop in Eton High just a few doors from Gordon Painting's cycle shop. 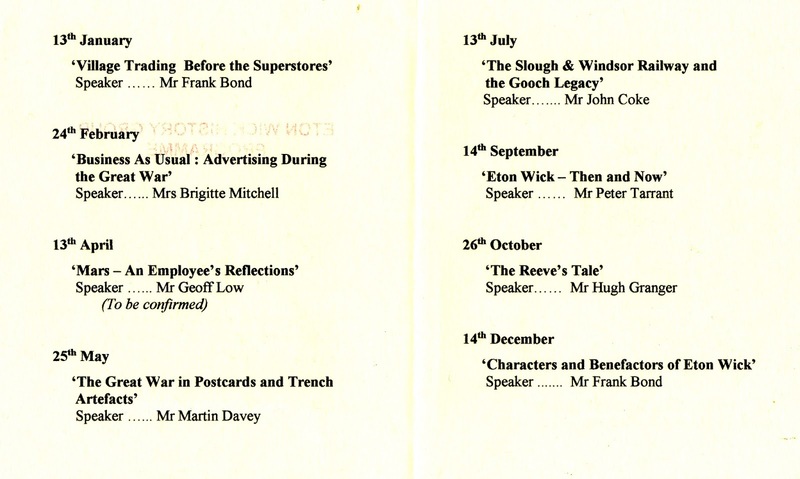 Also of note were the 3 Pubs, other small general stores and Mr Sibley who was the alternative newsagent in the village. There was also a Cycle shop operating from a Garden shed in a house at the end of Alma Road. I suspect that many older residents will remember my greatest mark on the village was my painting my half of the semidetached house no 60 Eton Wick Road which is now 150 years old bright Blue, fortunately the next inhabitant had a little more taste than I and returned it to White. I would finally like to pay tribute to both my parents for their dedication of opening their shop for all those years from 6.00 am to 7.00 pm six and a half days a week for 364 days a year. They were also foremost in raising funds with many others for the Catholic Church. Prior to this Mass would be said on a Sunday in the village hall, but after a plot was designated by Eton Urban District Council the fund raising was continued in earnest. 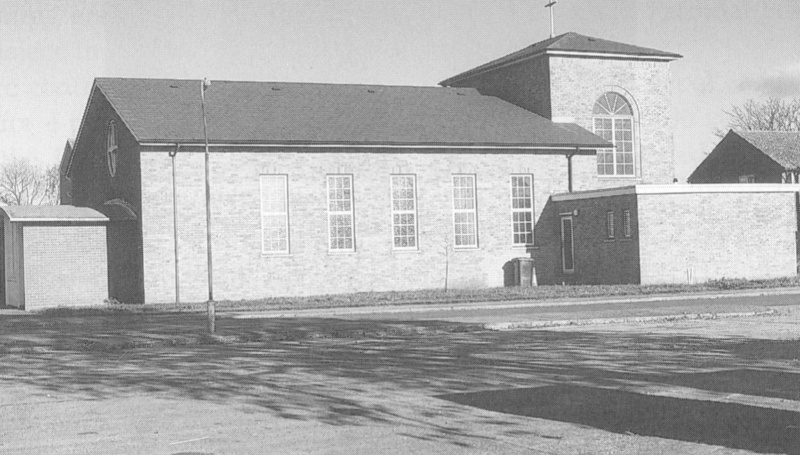 Once sufficient Funds had been raised, the Diocese sanctioned loans to be made and the Church to be built. I am indebted to Theresa Stanton on when it was finished which was in 1964 and I was married there in January 1966. What a great pity that it is reported elsewhere that services may end due to various factors. Please accept my apologies if I have made any errors or omissions as my memory was never that good, as many paper round customers can testify from incorrect deliveries. I do however hope that these recollections jog a few memories. To arrive at an estimated number of Eton Wick and Boveney villagers (130) who served in World War II, we used the total UK fatalities of 400,000 and the total who served — 4,680,000. It will be seen that one is approximately 9% of the other or one in eleven. If Eton Wick had twelve deaths and the national average applied, then 131 people served. A list was then prepared of all those people remembered and this was checked and amended by two other local citizens of that era. We have arrived at 128 — Luck? Guesswork? Or hopelessly adrift with our memories? There were probably more service people on the Dorney Common gun site throughout the war than the estimated 130 villagers who left to serve elsewhere, so the community was not exactly bereft of young men or women. The Dorney camp soldiers were housed in Nissen huts which they vacated when the war ended. Houses were in desperately short supply and several of the returning service men who were newly married, took unto themselves squatters' rights in the Nissen hits. That first winter was worse than any in the subsequent 60 years and severe floods inundated the common and the huts. Of the twelve service fatalities from Eton Wick in World War II, all were men, nine from the Army and three from the Royal Air Force. Their places of burial or commemoration were — three in the U.K., two in France, two in Italy, one in Burma, one in Libya, one in Egypt, one in Syria and one in Luxembourg. The youngest was 21 years old and the oldest 58, being someone who had volunteered for service and died of T.B. This is an extract from Recall 60 years on.